BANGALORE: The neighbourhood of tony Koramangala woke up to a shocking Sunday when its residents saw cops entering the house of software engineer Amit Budhiraja to find him hanging from the ceiling fan. His wife Rinku Sachdev was lying dead on the bed. A suicide note was found at the spot. Amit (30), from Delhi and employed with Infosys for nine years, allegedly smothered his wife Rinku (28) with a pillow, suspecting her of having an affair with a colleague. He then committed suicide by hanging himself. Rinku, from Mumbai, was a marketing executive with a leading private bank. They had married a year ago in Mumbai. The incident came to light on Sunday when Rinku’s friend Urmila, who lives nearby, went to their house after her repeated calls to Rinku went unanswered. Rinku was supposed to go for the new Bollywood release, Race, with Urmila in the morning. The house owner on the ground floor was then alerted and the police were informed. Cops entered the house with the help of a duplicate key provided by the house owner and found the two bodies along with a suicide note. "The couple must have had a fight on Saturday night. 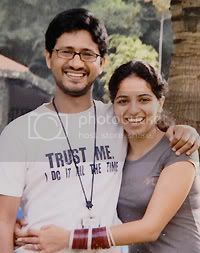 In a fit of rage, Amit smothered his wife and later hanged himself. A death note left by him read he killed Rinku for having an extramarital affair with a colleague," said police, adding bloodstains were found in the bedroom where their bodies were recovered. It appears the couple had frequent fights over the alleged affair. "Their troubles began after Rinku started coming home late from work," said a police officer. The police have booked a case of murder against Amit, even after his death. As for his death, a case has been filed under unnatural death report section. "We will speak to their friends and family members if they want an investigation. However, family members haven’t registered any complaint," said police officials. Amit's friends said he was 'an intelligent bloke' they ever come across. "He was very intelligent. Amit would use network sniffers to peep into what was happening in others' desktops," recalled a friend, who came to St John's Hospital. "People used to be very careful of their computer security as they knew that there was a 'Peeping Tom' monitoring their actions. Amit used a software called Iris to replicate what was displayed on a desktop," the friends added.